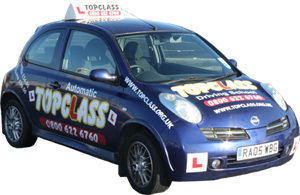 Here at Topclass driving school we believe in keeping our pricing competitive without compromising on Quality of tuition. We offer driving lessons from as little as £18.90 an hour, helping you to save money on your driving lessons. We also offer great discounts for block bookings, students, NHS, and armed forces. Check out our great Introductory special Offers on 3, 5, and 10 hour driving packages. Our male and female driving instructors are DSA approved and fully CRB checked. We offer a choice of daytime, evening or weekend Driving lessons and for your convenience we will pick you up from home, work or college allowing you to fit your driving lessons around your personal commitments. We can provide 1 or 2 hour driving lessons or you can learn to drive in 1 - 6 weeks with one of our Intensive driving courses. Motorway and refresher lessons available from £25 per hour, If you've passed your test but are unsure about driving on motorways or just want to refresh your skills and increase your confidence, we offer motorway and refresher lessons. Please call us for more details. Pass plus courses also available £150, Pass Plus is a voluntary scheme that offers benefits to all. To the new driver the course offers cheaper insurance. To the insurer it offers less accidents, and to the general public safer roads. Visit our pass plus page for more details. Intensive driving courses also available, Topclass driving school Gillingham, provide intensive driving courses in Gillingham, Medway and most of Kent, Our intensive courses start from a short 8 hour course for someone who has recently failed their driving test, right up to the 35 to 40 hour intensive course suitable for the complete novice. Visit our Intensive courses page for more details. We also cover short notice tests, (with less than 10 working days notice) lessons range from £25 per hour (please note that no special offers can be taken with short notice tests) Please call us on 0333 772 0393 for more details.